How much does it cost to travel to Cochabamba? How much money will you need in Cochabamba? $b163 ($24) is the average daily price for traveling in Cochabamba. The average price of food for one day is $b75 ($11). The average price of a hotel for a couple is $b136 ($20). Additional pricing is in the table below. These average travel prices have been collected from other travelers to help you plan your own travel budget. 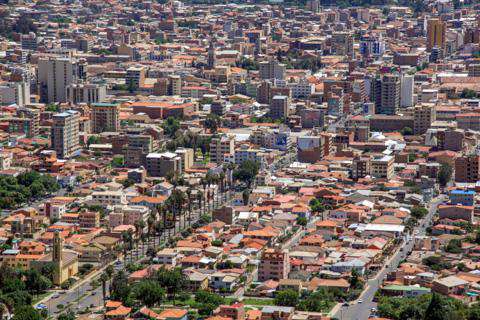 With a population of about 630,000, Cochabamba is the fourth largest city in Bolivia. It's located about 240 kilometers from the capital city of La Paz and is surrounded by mountains, but sits within a valley. The city is known for its gardens and has many sights to offer the visitor. Cochabamba offers a calming retreat that is a refreshing break from the hustle and bustle of many South American cities. It's a great location to learn Spanish and there are plenty of activities and cultural events that you can enjoy in and around town. Cochabamba's climate is semi-arid. There is an extended dry season between May and October and the wet season is from November to March. The days are warm and the nights are cool. There are a handful of great sights around Cochabamba. Head to Cristo de la Concordia, the city's famed statue of Jesus, which overlooks the area. Simon I Patino Cultural Center has many mansions, gardens, and museums worth visiting. Also popular with visitors are the Museum of Natural History, the Medical Museum, and the Museum of Archaeology. Cochabamba has many different neighborhoods with interesting character. The area continues to grow with Bolivian nationals, expats, and foreigners alike. Some of the most historic and affluent neighborhoods in the city include Cala Cala, El Mirador, and Lomas de Aranjuez. These areas have impressive architecture and residences. You'll find no shortage of budget accommodation around town. Quality is variable so read reviews before you make a reservation, but generally the hostels are comfortable and welcoming. The city caters specifically to expats, so long term and luxury accommodation are also readily available throughout the city. The city is also well known for its paragliding opportunities. You can easily take a class and try it first hand. A full length beginner's class will take about ten days, but it is the cheapest option you will find anywhere in the world. You can expect two hours of classroom work, and four hours of practice daily and the course includes twelve solo flights. There are a variety of volunteering opportunities in Cochabamba as well. Sustainable Bolivia coordinates volunteers and local grassroots organizations in the city. They also offer Spanish, Quechua, and Aymara classes. Instituto para el Desarrollo Humano is a social justice organization that also works with volunteers in the area. Spanish lessons are popular in the city as well. There is a large expat community and social activities are well organized. This is a pleasant city to spend an extended amount of time, and there is plenty to do to keep you entertained. There is also a well established weekly language and culture exchange every Tuesday. The event is free of charge and is a great way to meet other expats in the area. Cochabamba claims to have the best food in Bolivia and many visitors agree. The city is in close proximity to much of the country's agriculture so food is fresh and plentiful. You'll find no shortage of restaurant options around town and there are a diversity of price options for travelers. Food is often delicious, so your best bet is to wander around town until you see a place that appeals to you. There are also plenty of bars around town to pick up a drink. Most of the interesting ones can be found on 25 de Mayo and Espana close to Plaza Colon. The Cochabamba region is also thought to have the country's best chicha. Chicha is a fermented corn based drink, although it is sometimes made with peaches. Cochabamba's airport is Jorge Wilstermann International Airport. It is well connected with other large cities in Bolivia and flights are usually affordable. The bus terminal is about 6 blocks south of the center. From there you can catch buses to La Paz, Santa Cruz, Sucre, Potosi, Tupiza, and Samaipata, among other destinations. Once you're in town there are buses (micros), mini-vans (trufis), and shared cabs (taxi-trufis) that you can take along fixed routes. You must request that the driver stop by saying "me bajo", "voy a bajar", or "esquina". Taxis are relatively easy to find. Taxi drivers are usually honest, but it is always best to agree on a price before you get in the vehicle.